The movement of the body is important for maintenance of one’s health and well being. When you are on vacation, the tendency to gloss over adequate movement and exercise often occurs. There are many ways to exercise one’s body when one is on vacation. One way that you can move the body is to make use of a chair. Chair exercise is an accessible format that can be used when you are on vacation. Exercises that address basic spinal movements are always a good bet. The spine, being the bodily expression of health and vitality, when healthfully maintained, will positively affect the quality of one’s actions. These are basic movements but they should still be approached with a degree of awareness and caution. If anything is painful or aggravating, do not do it. Breathing is important when performing these movements. 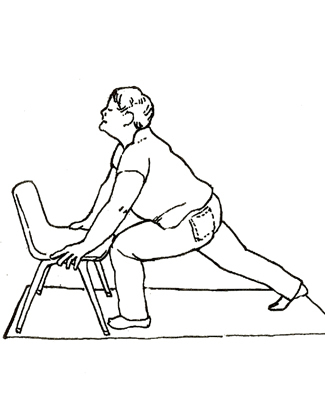 Sitting in the chair, the individual will place their hands on their knees and keep the arms straight. On the inhalation, you will lift your chest to the ceiling. On the exhalation, you will arch your spine toward the chair. This will gently warm up the spine. Standing up and facing the chair, you will position yourself so that you can lean forward and grab the chair. With the arms outstretched, hinge forward at the hips and lean the torso forward. Keep the spine straight, keep the core engaged and the arms and torso aligned with and to each other. 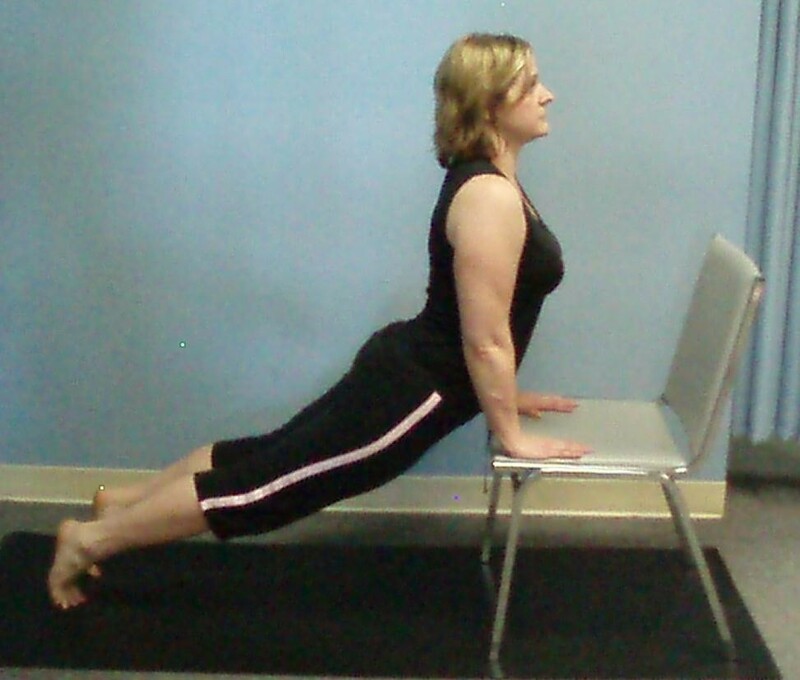 Use the chair to support your body as you lower yourself. Breath. While sitting in a chair, move your hips to the front of the chair. Sitting square to the front, extend your right arm up. As you extend your arm up, lean your body to the left. Repeat on the other side. Breath. These types of movements are great for strengthening the back and arms. Start with the lunge movement. With hands on the seat, extend one leg backward and bring the other foot forward. The extended leg thigh and the forward foot hip will get a stretch. Repeat on the other side. For a deeper stretch, place both hands on the chair and extend both legs back. Squeeze the inner thighs toward the ceiling, roll the shoulders back and lift the chest up. Breath. While sitting in a chair turn your body so that your legs are on the left side of the chair. Turn your torso so that it faces the back of the chair. Use your hands to support you in this position. Breath. Repeat on the other side. Previous postThe Koshas and Infinity: Physical, Energetic, Mental, Contemplative and Spiritual Implications.